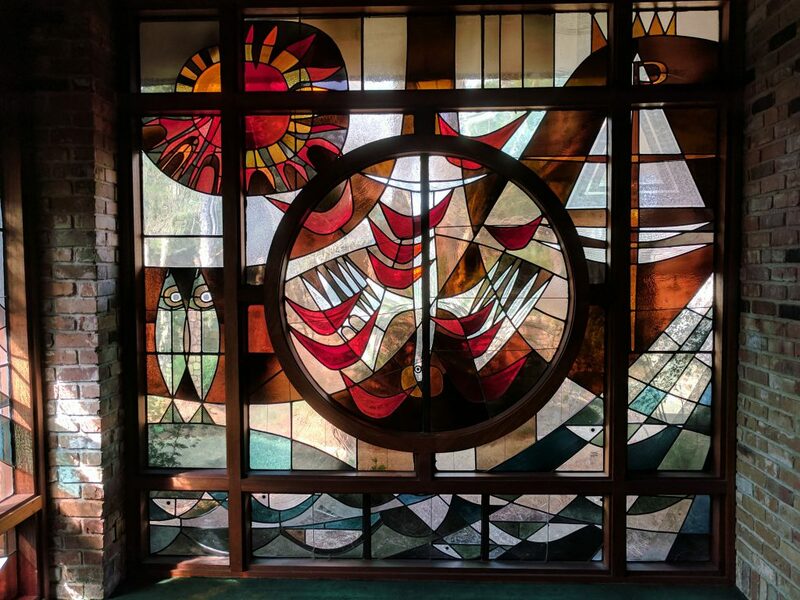 The stained glass windows in St. Ignatius Church were designed by Francis Deck, of the Emil Frei Art Glass Co., of St. Louis, Missouri. 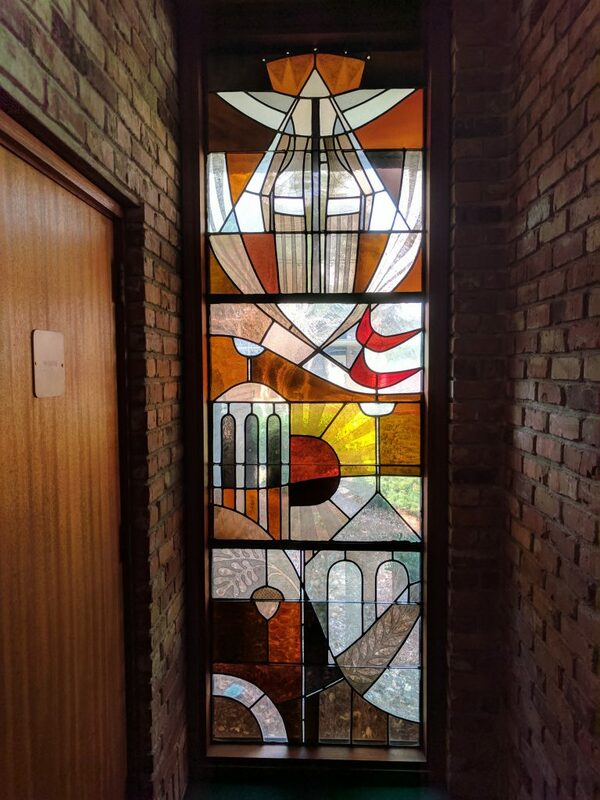 They were executed by Robert Frei, grandson of the company's founder, Emil Frei, Senior, and installed in 1977, during construction of the church. The general theme of the windows is the life of St. Ignatius Loyola, founder of the Society of Jesus, and patron of our parish. Below are photos and description of the windows. The descriptions were presumably written by the windows' designer, Francis Deck. Note: Five windows were added during the 1990's church addition. These windows are not shown. The fall of our first parents - the initial sin - symbolized by the tree, the apple, and the serpent; and the sin of the fallen angels suggested by the spirit-like winged figure descending into flames. 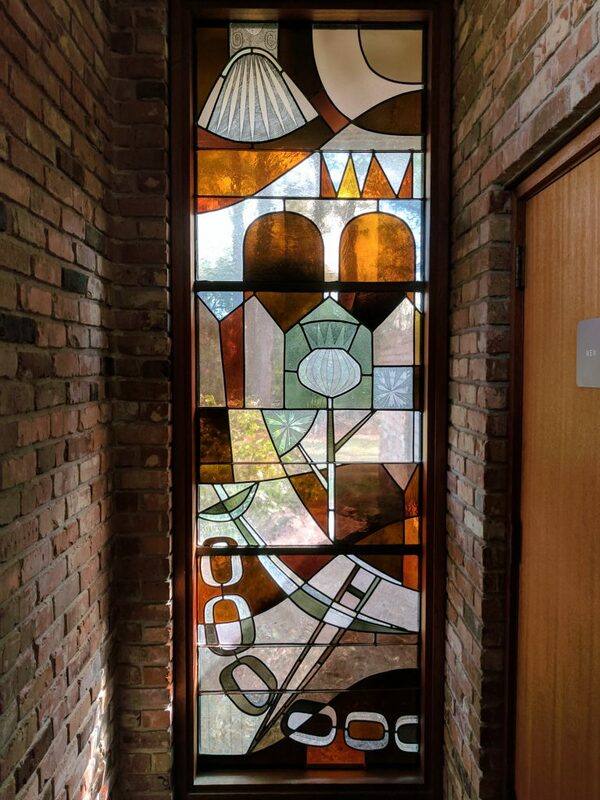 The remission of the original sin through the Sacrament of Baptism is expressed by the shell and water at the opposite side of the window. St. Ignatius urges contemplation on the use of the five senses as instruments in performing sinful deeds. The five senses are symbolized simply by five encircled crosses - the crosses suggesting the former practice of anointing the senses in asking remission of sin and the ability to resist further sin. 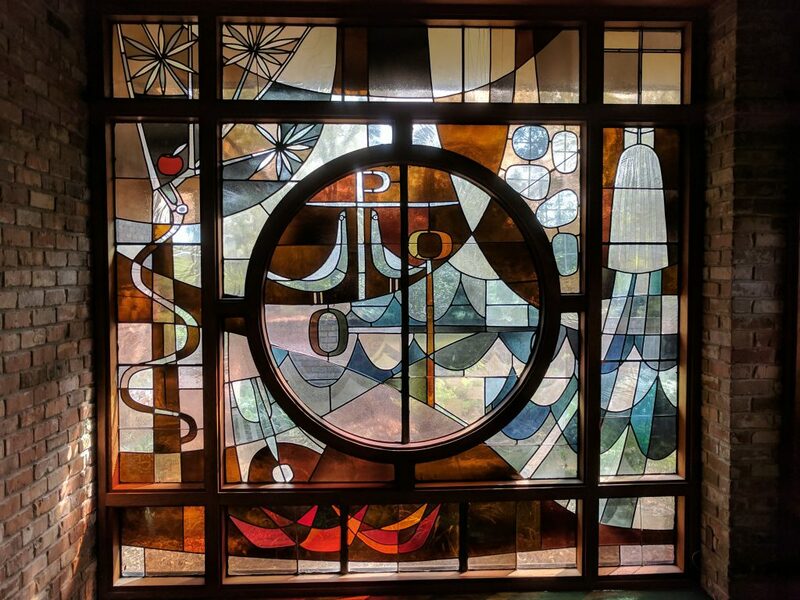 As general confession is a part of St. Ignatius’ first spiritual exercise, the center panel of the window suggests symbolically the remission of sin through the Sacrament of Penance or Reconciliation. The crossed keys are traditional symbols of the Sacrament - one suggesting the locking our of the soul from eternal happiness through sin and the other the opening of the path to heaven through the Sacrament. In our more contemporary thinking on the Sacrament, the birds standing below the Chi Rho suggest reconciliation with Christ. The subject matter is based on Christ’s life and public ministry on earth. 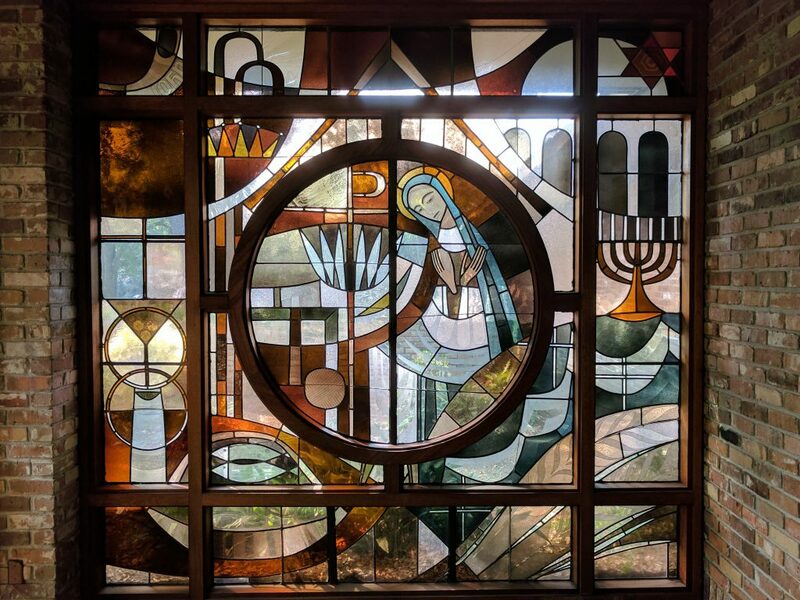 Centrally located is the figure of the Blessed Virgin Mary, and within the circular form in the window is a symbolic reference to her motherhood. The Chi Rho symbol of Christ grows from the lily indicating her immaculate conception. The Holy Family is further suggested with the symbols of St. Joseph, the square and hammer, and the ball of yarn used by Mary as mother to provide clothing for the family. In the upper left the ram’s horn suggests S. John as the forerunner of Christ and the shepherd’s staffs and crown the shepherds and kings who visited the infant at Bethlehem. The star of David, the seven-branched candlesticks and temple silhouette recall Christ teaching the doctors in the temple. In the lower left two of Christ’s important miracles during His public ministry - the rings, grapes and wine flask recall His changing water into wine at the wedding feast at Cana and the basket with seven loaves and fist his multiplication of loaves and fishes to feed the multitude. The palm branches in the lower right suggest His triumphant entry into Jerusalem. On Christ’s passion. Centrally located are three crosses - the center cross on which Christ died and on each side the crosses of the thieves who were crucified with Christ. The crown of thorns is indicated at the upper part of Christ’s cross, and the nails at the points of the hands and feet. The chalice receives the blood of Christ stemming from the center of the cross indicating the reenactment of Christ’s death in the Eucharistic celebration. The Last Supper is recalled by the table and halos of eleven apostles present while the halo of Judas stands apart from the others. The denial of Peter is recalled by the presence of the rooster, and the betrayal by Judas by the moneybag and coins. On the left below the symbol of the Last Supper is a symbol of the Paschal Lamb before the feast of the Passover and above it again the star of David suggesting the Jewish tradition. In the lower right the burial of Christ is indicated by the Chi Rho in a horizontal position contained within a form suggesting the burial. Three oil containers recall the oils brought by the holy women to anoint Christ. On Christ’s risen life. The sun in the upper left symbolizes the Resurrection. The dove with tongues of fire recalls the descent of the Holy Spirit in the center panel. The two fish overlapping each other suggest the dual nature of Christ as God and man. The Chi Rho within the triangle symbolizes the Ascension and Christ's reunion with the Father and Holy Spirit to reign forever. Christ’s kingship is indicated by the crown. 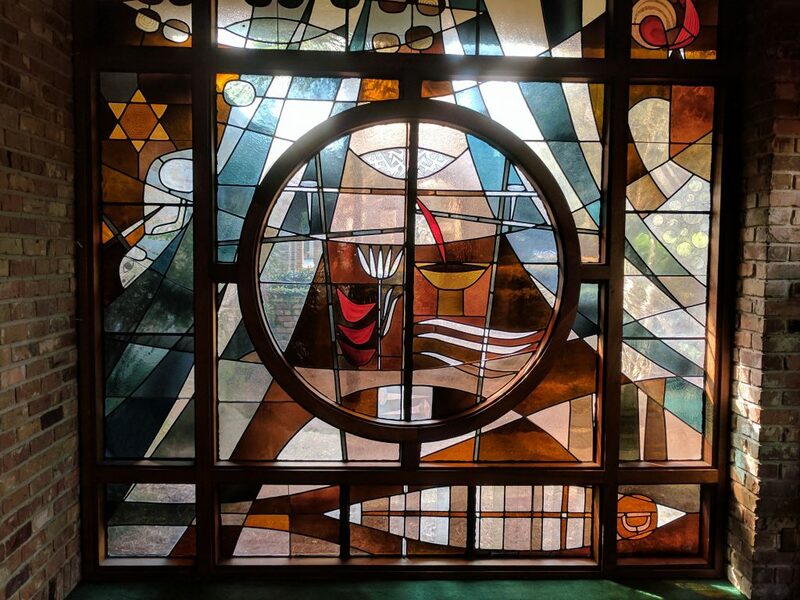 The miraculous draught of fishes and Christ’s last meal with seven disciples on the shores of the Sea of Galilee before His ascension is suggested by the nets and water in the lower segment of the window. The shell suggest his Baptism. The crown and arched forms suggest his early days in the Court of Ferdinand and Isabella. The thistle growing into these forms suggests the downward course of his life in these surroundings. The sword suggests his military life service which followed and the crutch the injury to his leg which resulted. The chain suggests his capture and captivity after his injury. It was in this time of captivity the reconstruction of the life and thinking of St. Ignatius took place. The symbolism relates to the spiritual formation of St. Ignatius and traces his activities from Barcelona to Jerusalem. This journey as indicated by a thin line extending the length of the window between the names of the two cities, and his travels at sea are suggested by the boat and waters. 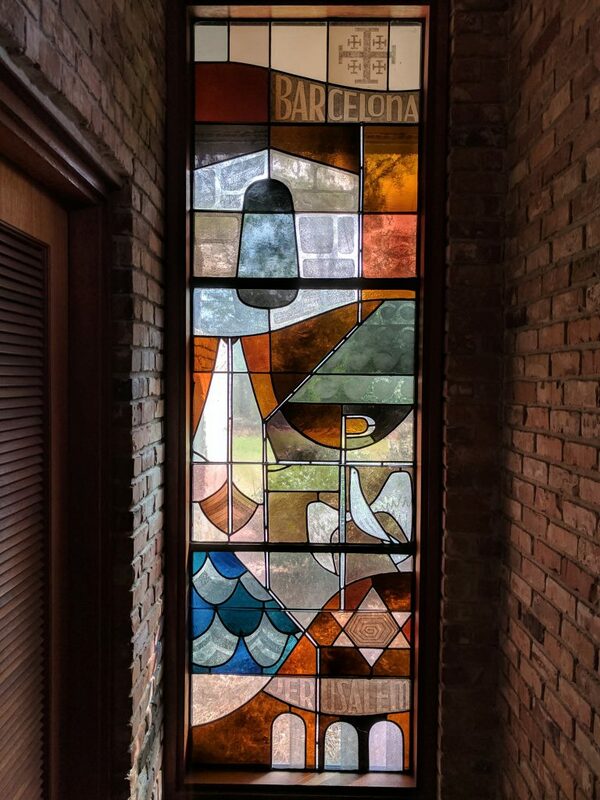 Early in his period of spiritual formation his stay in a cave at Manresa is recalled by a symbolic suggestion of the cave in the upper left portion of the window. His intense desire to conform to the life of Christ is suggested by the Chi Rho and dove. The crusaders cross appears at the top of the window. The studies and companions of St. Ignatius. The book, pen, and lamp suggest his period of study. 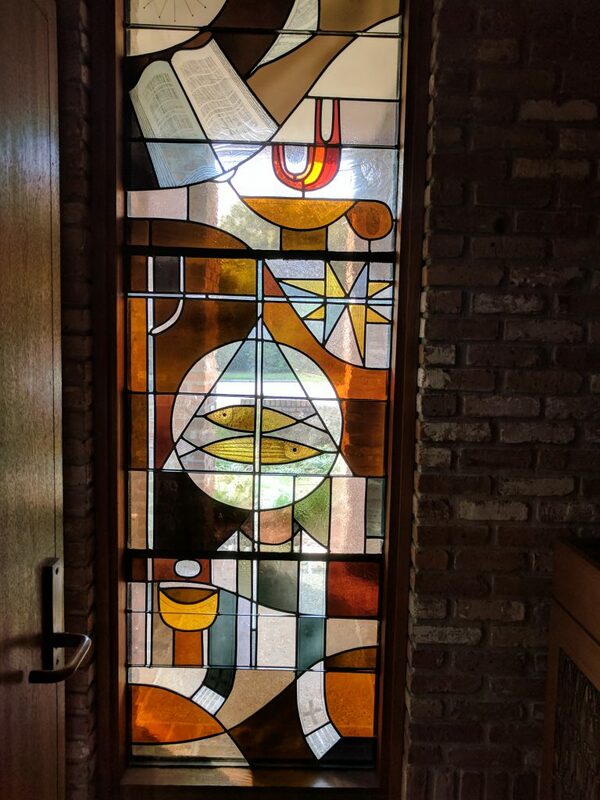 In the center of the window the symbolism is a simple summary of dogmatic theology, the substance of the studies of St. Ignatius. The mysteries of the unity of the Trinity, the creation, incarnation and redemption are suggested by the triangle and circle (Trinity); the creator’s star (star); two fish (dual nature of Christ and incarnation); cross (the redemption). The pilgrim’s staff is a symbol of St. Francis Xavier and recalls his lasting friendship with St.. Ignatius. The eventual ordination of St. Ignatius and his followers is recalled by the stole and chalice and host. The founding of the Society of Jesus. The influence of the Holy Spirit in this effort is suggested by the dove at the top of the window. The Papal tiara and crosier indicate the Papal approval in 1540. 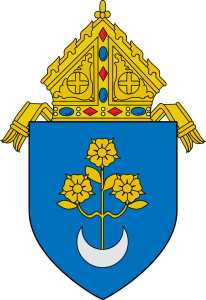 The Jesuit insignia appears adjacent to the tiara. 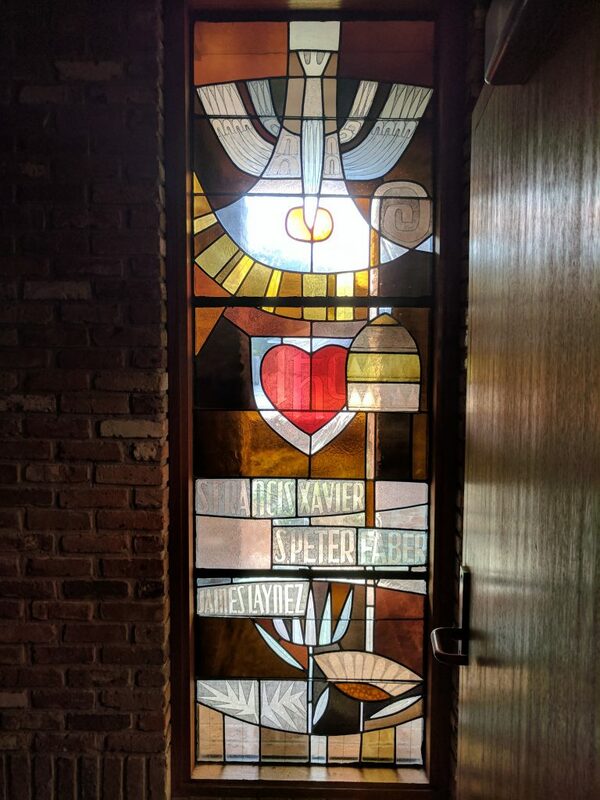 The names of three of St. Ignatius’ most ardent companions (St. Francis Xavier, St. Peter Faber, and James Laynez) appear in the lower sections of the window and below their names symbols of the vows of poverty (thistle); chastity (lily); and obedience (sunflower, because of its faithful following of the path of the sun in the sky). Of all his extended works nearest the heart of St. Ignatius were the building and foundation of the Roman and German colleges. These are sumbolized by th two buildings surmounted by crosses. The symbols accompanying suggest attributes embodied in the rule of theJesuit order as: live (flames); the sun suggests discipline; oak leaves -perseverance; and the olive branch peace. At the top of the window the death of St. Ignatius is noted in his reception into the company of the Trinity by the hands of God. The palm branches crossed suggest his death, and the crown his eternal reward. Teaching - the candle suggesting enlightenment. Poverty - the pine tree with a suggestion of rocks at its basis because of its ability to survive in the impoverished terrain. Following of Christ - Chi Rho and birds. Inner peace - olive branches.